For years, a trend in backpacking has been gaining popularity and respect in the outdoorsman community. It's called fastpacking and can most easily be described as running with the lightest pack possible. Sound intense? It is. So What Exactly Is Fastpacking? Take the leisurely pace of most hikes and multiply it by 10. Now take the pack that you typically carry, and lighten it to about 10 to 15 pounds. That's fastpacking in a nutshell. Fastpacking has been growing more and more popular for those seeking new adventures. Speed hiking is difficult and only for those whose body can handle the stress and strain of moving quickly along rough terrain. But for some, fastpacking is the latest trend and is considered completely different than hiking. In fact, it's considered an endurance sport. Fastpackers aim to cover as much distance in as little time possible and only carry the bare essentials. It is not uncommon for these hikers to cover distances from 20 to 40 miles in just one day. Sure, it helps that they are carrying lighter loads, but fastpacking is not for the weak. 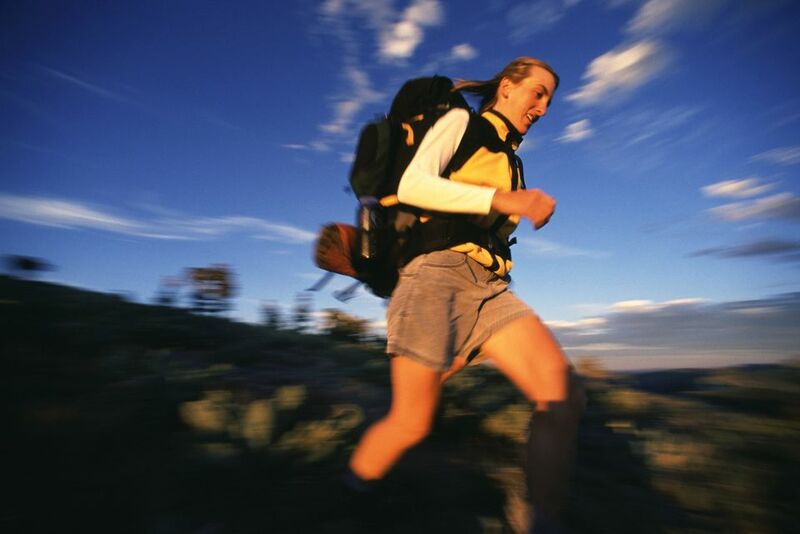 Often fastpackers will run much of their distance bringing many challenges to the body. As if the endurance needed wasn't impressive enough, it's important to note that fastpackers deny themselves even the slightest camping luxury. In other words, you can forget about that sleeping bag, ground mat, or a hot meal. Bulky items will only weigh you down, so items like tarps and energy bars must suffice. In order to cover such tremendous distances, there are a few things you need to have and to know before setting out on a trip. Pack: Look for packs made of lightweight fabrics that are small in size (2,500 to 3,500 cubic inches). Your pack should not be able to hold more than 35 pounds, and to be a true fastpacker, you shouldn't be carrying that much weight anyways. Clothing: Think light and versatile. Since you can wear most of your clothing, you don't need much in the pack except for one change of socks and underwear. Items like long underwear (stick to breathable brands like Polartec) can double as a body warmer or used to protect from the sun. Wear lightweight hiking pants (nylon-cordura), many of which can unzip to transform into shorts if needed, or stick to running shorts if the day will be hot. Keep rain gear down to a lightweight shell or basic water-resistant windbreaker or pants. And be sure to pack light poly gloves and an extra pair of poly-wool socks. Shoes: Trail running shoes are your best bet though some fastpackers prefer running shoes. Just remember, your feet could get wet, depending on weather and trail of choice, so a vapor barrier sock may be necessary. Shelter: Ditch the tent for a tarp and stakes or an actual tarp tent. Though you won't have the best protection from rain or bugs, you are fastpacking so there's a bit of sacrifice that comes with the territory. Some trails may even have backcountry shelters open available for use. Sleep: Sleeping bags and ground mats can tip the scale so try and keep the weight of the items combined to no more than 3 lbs. Look for sleeping bags that are rated for a higher temperature and pack it in an ultralight down bag to compress the size. If you can't rough it and sleep mat-free, try an inflatable mat or foam pad. Food: How much you bring will be determined on how many days you will be on the trail. For example, for 2 days you need 2 breakfasts, 2 dinners, and some energy snacks. Bring items that do not need to be cooked such as energy bars and candy. For meals and snacks, bring Powerbars, Clif Bars, jerky, or gel packs. If you want a hardier dinner, dehydrated packs or couscous soaked in cold water may be as close as you get. As for water, one gallon should do but consider iodine or water purification tablets to cut down weight. Absolute Necessities: These are the items you cannot afford to skip out on: pocket knife, map, compass/watch, lighter, first aid kit, biodegradable toilet paper, a small tube of sunscreen, headlamp or pen lamp (bring an extra battery, and a small bottle of DEET bug spray. Also be sure to a whistle and/or mirror (for signaling) and repair tools like duct tape or rope. So, you're all packed and ready to run? Not so fast. Fastpacking takes a lot more planning and preparation than a typical getaway. You are taking the bare minimum so getting stuck or lost somewhere in the backcountry can be dangerous. Be sure to stick to trails that are well-established, mapped, and well-traveled. As with any trip, make sure you let someone know when and where you will be traveling. John Muir Trail: 211-mile trail located in California. Tahoe Rim Trail: A total of 165 miles in Nevada and California. Grand Canyon: Rim to rim, this trip is 42 or 47 miles depending on which way you go. Pacific Coast Trail: A 2,650-mile national scenic trail that runs from Mexico to Canada through California, Oregon, and Washington.